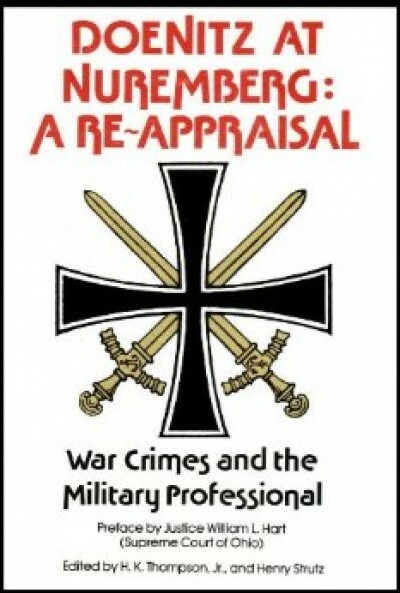 The full title of this book is: "Doenitz at Nuremberg: A Re-Appraisal -- War Crimes and the Military Professional." There are two editions of this book, the regular issue, and a special edition of only 250 printings containing a page autographed by (Grossadmiral) Karl Donitz: reading "This is copy No. ___ of a limited edition of 250 copies personally signed by Grand Admiral Karl Doenitz". Both editions contain the reprinted facsimile autographs and photographs of over 400 worldwide military officers and politicians, who also wrote a brief paragraph explaining why they believe Admiral Doenitz (Donitz) should NOT have been convicted of the WWII "war crimes" counts levied against him during the 1946 Nuremberg War Criminal trials. There are many very interesting and surprising writings from Allied navy admirals and army generals noting why they believe Adm. Doenitz should have been acquited. This is a "much needed" reference book for those of us who are autograph-collecting "hounds" of WWII personalities. Not a critical analysis of Donitz' personality.